Annette Finnigan. Courtesy of Houston History Magazine. Image available on the Internet and included in accordance with Title 17 U.S.C. Section 107. FINNIGAN, ANNETTE (1873–1940). Annette Finnigan, suffragist and art patron, was born into the family of John Finnigan in West Columbia, Texas, in 1873. When she was three years old her family moved to Houston, where her father developed business and real estate interests. She attended Houston public schools and received a diploma from Tilden Seminary in West Lebanon, New Hampshire. In 1889 she entered Wellesley College, Wellesley, Massachusetts, where she developed skills in fine arts and athletics and graduated in 1894. She then studied philosophy at Columbia University and worked as an administrative assistant to her father. She also began a long-term practice of travel in the United States and abroad. Women Voter Flyer. Courtesy of Texas State Library. Image available on the Internet and included in accordance with Title 17 U.S.C. Section 107. 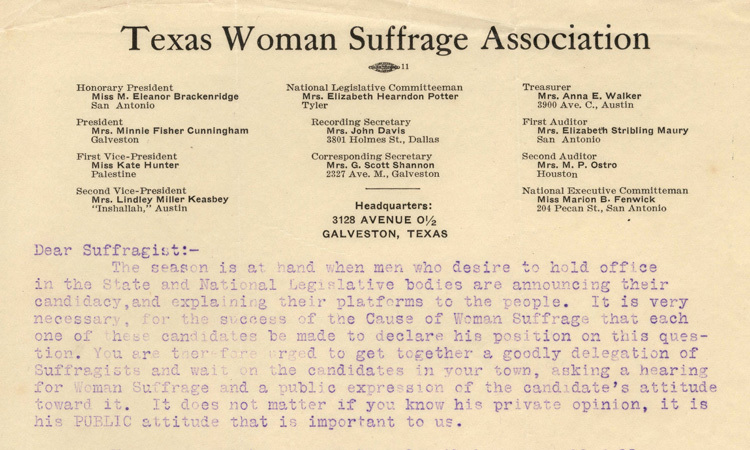 Texas Woman Suffrage Association Letter. Courtesy of the University of Houston. Image available on the Internet and included in accordance with Title 17 U.S.C. Section 107. By 1903 Annette Finnigan had returned to Houston, where she collaborated with her sisters, Elizabeth Finnigan and Katherine Finnigan Anderson, in launching equal-suffrage leagues in Houston and Galveston-the first twentieth-century woman suffrage efforts in Texas. In the next three years the sisters organized statewide, helping to establish the State Woman Suffrage Association. Annette served as its president from 1904 to 1906. The Finnigans left Texas by 1908, however, and the association disintegrated in their absence. When her father died in 1909 Finnigan assumed management of his businesses and began dividing her time between Houston and New York. 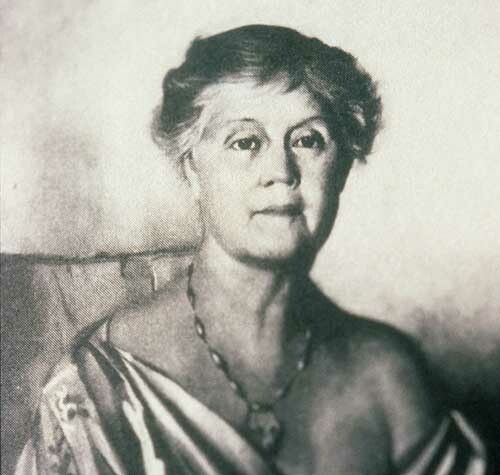 In 1913 she revived the Houston suffrage league and for the next two years shared leadership of the renewed Texas Woman Suffrage Association with San Antonian Mary Eleanor Brackenridge. Finnigan corresponded with state legislators in 1914, requesting a voters' referendum for a constitutional amendment to authorize woman suffrage. In January 1915 she moved to Austin to lobby the legislature for this resolution. Though it received a majority vote in the House, the Senate did not consider it. Still, suffragists had gained increased publicity for their cause. 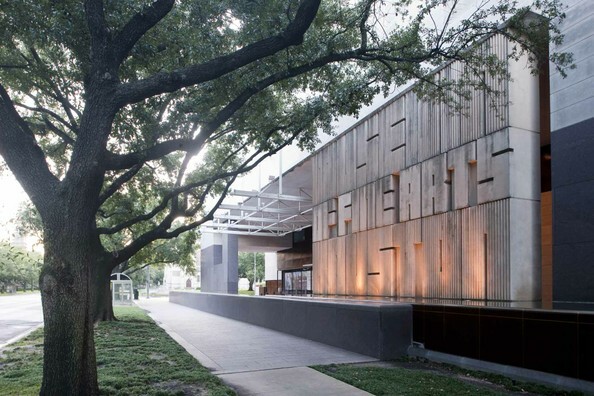 Houston Public Library. Courtesy of Houston Public Library. Image available on the Internet and included in accordance with Title 17 U.S.C. Section 107. In 1916 Finnigan contracted a paralysis, which permanently debilitated her right arm and required her to use a cane. She not only retired from business and athletic activities but also discontinued political organizing. After moving to New York, she generally made winter sojourns to Houston, where she joined the local art league. She devoted the remainder of her career to traveling and cultural philanthropy. She had interests in European, Oriental, and Near Eastern antiquities and rare books. She frequently consulted with the curator of the Museum of Fine Arts, Houston, before embarking on tours, and returned with prized art objects to donate to the museum. These included Mediterranean vases and jewelry, Oriental and Near Eastern textiles, Spanish sculpture, and a lace collection. Like her father, who had endowed the Houston Carnegie Library fund, Finnigan also favored the Houston Public Library in her giving. She conducted research in Europe to collect illuminated manuscripts and sixteenth-century literary classics for the library. Also, she donated early Texas books and maps. Months before her death, she gave eighteen acres of Northside land to the city of Houston for use as a park, intending it particularly to benefit black residents. In 1940 Finnigan's health declined, and she spent the last two months of her life in treatment for cancer at Memorial Hospital, New York. She died there on July 17, 1940. Her cremated remains were sent to Houston for burial at Glenwood Cemetery. Her will provided for a $25,000 grant to Wellesley College, as well as large contributions to the American Foundation for the Blind and the American Commission for Mental Hygiene. Houston Chronicle, July 18, 1940. Jane Y. McCallum, "Activities of Women in Texas Politics," in Texas Democracy, ed. Frank Carter Adams (Austin: Democratic Historical Association, 1937). Handbook of Texas Online, Sherilyn Brandenstein, "FINNIGAN, ANNETTE," accessed April 19, 2019, http://www.tshaonline.org/handbook/online/articles/ffi35.